Neighbours turn out to surprise a Somerset couple who have used their own experience of disability to help others. Paul Martin and Irina Aggrey collect donated items. Browse content similar to Nailsea. Check below for episodes and series from the same categories and more! Well, today, in this street, all that is about to change. Because we're throwing a party, and everyone's invited. who have spent years helping the elderly and disabled in their town. the impact they've had on people. they've dedicated their lives to helping others. I am just so proud of both of them for everything they've done. to find items we can sell. Oh, yes, they're all right, there we go. A tight fit. It won't all be plain sailing. Come on! I need to get into the house. the rest we'll sell on bric-a-brac stalls and at our street auction. to give Chris and Lynn a surprise thank-you. But how will they react when they find out all of this is for them? Today we are in Nailsea, a small market town in Somerset. that's a lifeline for many people in the community. and is run by Chris and Lynn Baker. We told them we're making a film about communities. and have lived in Nailsea ever since. Their children, Jason and Sharon, grew up in the town. they absolutely love spending time together. They're inseparable. They love going out and about, sightseeing. And they love each other very, very much. and volunteering as a retained fireman. But when Chris was just 45, tragedy struck. the next minute he's had a heart attack. It was the start of major health problems. A few years later, an operation left him partially paralysed. it completely changes when something like that happens. Your lifestyle has got to change. and it had a massive impact on him and my mum's life. because I was probably horrible to live with. She always... She was always there, you know. She was... It wasn't always, "Oh, poor Chris." It was never, "Poor Chris." It was always, "Yes, you can do this." And giving up wasn't an option for a man who'd once been so active. he found it really, really hard. But he wanted to do something. He didn't want to give up on life. and the local MP cut the ribbon when it expanded. "I'm a disabled person and I need to do something." with the birth of their first grandchild. My son is profoundly physically disabled. He stopped breathing when he was four days old. on top of all their problems. He can't use his arms. He's got to be fed through his stomach. He can't speak at all. He's the most happiest lad I've ever seen. And the way he fights, I wish I could fight like him. He is my best mate. Chris and Lynn are retiring. A perfect time to say thank you. we'd love to treat them to a luxury break away. I'm going to set us a target of £800. Now all we have to do is raise it. And this is how we're going to do it. which is happening here in about a month's time. to keep this a secret from Chris and Lynn until after the auction. -Morning, Paul, how are you? Bang on time. Give us a hug. from all of these houses. I tell you what, you do that side and I'll do that side. That's a good start, OK? But which of us will gather the most donations? A bit of Carlton Ware. Do you want it? Can we have it? It was Granny's, but I'm sure she wouldn't mind. Oh, thank you, thank you very much. -It's OK. Crown Devon, I think. That's nice, that's a nice bit of earthenware, nice old cream jug. 'and could date from the 1970s. 'but I'm more excited about the Carlton Ware dish. 'which was produced between the '30s and '60s. There we are, three items for our bric-a-brac stall. but someone's flagged her down. -I am sure you'll get something for them. Yes, they're great colours. They are very in at the moment. as everyone wants something unique. and I hope someone will pay £5 each. And she knows Chris and Lynn. Oh, they're lovely people, yes. Next up, it's neighbour Ivor. We need stuff for our pop-up auction or bric-a-brac stall. Anything you can give us? I'm in the process of digging some stuff out now. Brilliant. We will be going back to see Ivor in about an hour. Sally and her dog know Chris and Lynn from the drop-in centre. I've been in there for advice. You know, just that sort of thing. for a donation for the pop-up street auction next month. And I've just had a massive clear-out. I haven't got anything, I'm sorry. A little Wedgwood pot here. and the cat never used it, so it is brand-new. Just amazed. Maybe he was just a lazy cat. Thank you. to keep those claws off the furniture. New, these cat gyms retail at over £30. -We've got a couple of bicycles in the shed. Really old, though, and a bit cobwebby. -They do need a lot of work doing to them. 'Raleigh dates back to 1885.
they're not clumsy, heavy mountain bikes. 'I'd love to find a classic 1970s Raleigh Chopper. maybe a student, got a second-hand bike. That's brilliant. Absolutely thrilled to bits. These are lovely, these are lightweight racing road bikes. Ten gears, as well. I haven't seen stuff like this for a long time. Where can I catch you? There's an old antique table which will fetch a bit. Because I absolutely love the colour of the wood. so it can stand against the wall when not in use. and I think it should go straight into our saleroom auction. -Well, you're not having this. -..please? No, no, it's fine. -We make walking sticks, you see. -Oh, you make walking sticks? a light but very strong wood perfect for the job. And he's kindly giving us two of them. -Did you get a flyer? -Can you help us out? Do you know what it's about? I'll pick those up, you pick up all the bits and bobs. -That's good for our bric-a-brac stall. -what this is all about, OK? -run by Chris and Lynn Baker? They're my auntie and uncle. -No, I don't believe it. How do you think they'll react on the day? -Yeah, let's hope they turn up. -Can we come in and have a chat? They took it on the shoulder and got on with it. -They sound really, really great. And you know, it's onwards and upwards, isn't it? Well, it has to be, doesn't it? He'd rather be out helping somebody else. has Chris been helping out? Everybody is different, everybody has a different need. and didn't know where their next penny was coming from type of thing. that didn't even know they existed. has been invaluable to people using the centre. I'm a quadriplegic, so I filled out all the forms. They're perfectly entitled to benefits, they just need help. The centre also supports carers. Who's there for the people that are doing the caring? "Oh, who's there for me?" You can tell people where they can go to get support. spending more time in the garden with their family. and supporting him all the way through with it, which she has done. hopefully get them to donate stuff for their own cause. That's the bit I like, but we've got to find out about them. So wish me luck, OK? Wish me luck. What are your names? What's your name? -Linda, pleased to meet you. Chris, pleased to meet you as well. This is going to be my first cellar today. Number two. I wonder who WEG is? 'to keep his tools in, whoever he was. -I like that, WEG, that was obviously the owner. It's not WG Grace, is it? Well, look, this is going to come in handy. I don't know, £20 or £40 for it, but it's going to help. What's your passion? What do you like doing? I see you like a bit of gardening. Yes, he does potter in the garden, don't you? Yeah, I do like to garden. Obviously I can't do as much as what I would like to do. Why? What's happened to you? -Lost the use of his right side, yes. ..artery pressing on me, and my vein. with the right side of my body, doesn't work. -You're a real star, mate. He's always done community things, ever since he moved here. Have to keep quiet because they're still in the garden. and what he does for other people. Boy, what a lovely guy, what a lovely guy. Meanwhile, Irina is going up in the world. Angela's got a treasure trove of clothes in the attic. I have a skirt that I've never wore. -Still got the tag on it. Hi! 'Remember Sally who was walking her dog when Irina bumped into her? A little tea caddy, isn't it? Yes, I know, but they're Sri Lankan. Yeah, that's where all the tea comes from. 'Antique tea caddies usually lock to protect the vulnerable tea. or you could mix the blends up. But it is a touristy thing, you know. Oh, it's not that old. Yeah, probably needs a new tyre. A new kid's bike could cost £100 or more. I bet someone will pay 20 for this one, surely. Hello, Oliver, it's Paul again. Brilliant! Oh, I love that. -Well, that's what I thought. -Irina will love that. We'll take the pot. And the dogs don't bother you? No, they're best buddies. They play. Oh, the dogs look after you. See you at the party, hopefully. Bring your wife along. -And you can watch your stuff being sold off! And then go, "Oh, no!" I've got this chair for a start. -It's old, but it's my husband's grandfather's. Hello. What's the story behind this chair? so we thought we'd have it, but we don't want it now. It's a lovely chair. I think Irina has hit the jackpot here. Ian and Jill have dug out even more treasures. are made of pressed glass. and was first used in the 1820s to make door knocks. And in the summer house, would you believe it? More treasure for us. So who owned this, then? This is a twin lens camera and they're quite collectable. Are you going down there in a minute? Yeah, I'm going down there, that's our van. -My name's Paul. Did you get a flyer through your door? -Can you help us out? -He lives in there, I'll be seeing you in a minute. You carry on with that and I'll see you in a minute. I got a nice kiss there. We're going upstairs. Come on, then. Brilliant. All we've got to do is get it down the stairs. -That's easy enough, isn't it? Let me test the stairs out. Oh, yeah, they're all right. Here we go! You don't mind old dogs, do you? -Oh, I've had old dogs. Oh, don't get up, the legs are gone. -Oh, don't get up, stay down, stay down, stay down, stay down. Good girl, stay down, stay down. My German shepherd's back legs went like this. -He still goes out for a walk. -Oh, I know, I know. Oh, crikey, what, all of this? This is lovely, it's Picquot Ware. You can see it's all machine turned. When you flip the lid, you feel that. But it's so typical, it's so evocative of the '30s to '50s. It's a nice thing, it's a really nice thing. But it's got the look. contemporary 20th-century British modern at its very best. with a value of around £60-£80 and hopefully get that. and we'll let the auctioneer sort that out, OK? that will search online for those. And bye-bye, you, as well. "I have some toys, etc on the grass if they are of any use to you. Kids' toys, kids' games in really, really good condition. I see 50p, £1, £2, that's fantastic. Two bikes. A little doll's buggy. Let's pick up some of these and put them in the car. "Lots of love, Paul Martin." it's all safe and it's going up for sale. and work out what we can send to a saleroom auction. Someone is already sniffing around our treasure. First, I've got an upcycling project for Irina. Now, look at this, something for you. That's bevelled glass, so it's a quality mirror. -It's a good size for a hall or bedroom. I could do something really funky with that. -Has it got its tilt top? -Yes, it has, hasn't it? -The mechanisms... Let's put that into the saleroom. Yeah, tell me about this. -first-day issues, all that kind of thing. Yeah, I think we might have missed something, actually. Look what I picked up. This, apparently, is over 100 years old. Yeah, that's an Edwardian copy of the Queen Anne chair. That's nice. Shall we put that into the saleroom? -Yes, let's put that into the saleroom as well. -Let's see what it does. Let's see what we get for that. And these are our walking sticks. You can let me sell one and we'll put one into the saleroom. Why not, and compare the prices? OK, go on, then, which one are you going to sell in the saleroom? Oh, I don't know, you pick. I'm partial to both of them. You are the winner for today. 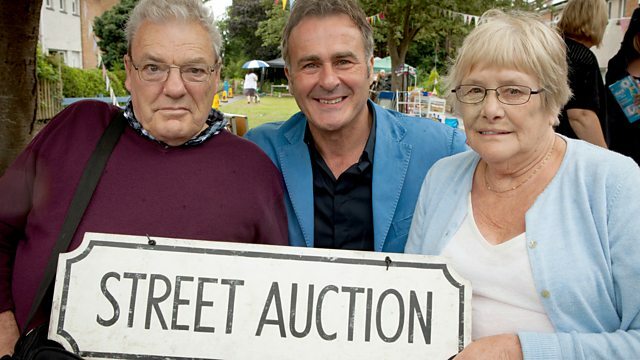 It's the day of our street auction. We've only got a few hours to get this place ready. ..set up our stalls and transform the street into a street party. Everyone is pitching in to help. Hi. Are you coming to our street party later? I'm going to try to. to help us reach our target. but most of you know who this is for. throughout the day helping out. we need to keep them entertained but also keep them in the dark. all that bric-a-brac and all the craft. King Charles spaniels. There's a pair, Staffordshire Flatbacks. Are you sure we can sell these? -You're giving them to us? This was pottery for the masses. so always known as Staffordshire Flatbacks. you always have a little hole in the back, which lets the air out. you can see there's a nice bit of wear on the foot. sort of the end of the Victorian period. 'so I hope one of our local dog lovers digs deep. ..and I know I can sell this. This will bring out the wheeler-dealer in me. And talking of inspiration, remember Ivor's black mirror? Look how Irina has transformed it. Yes, it was quite depressing. so I couldn't bring out the natural grains by sanding it. which is a decoupage technique. Yes, it's quite fun, but time-consuming. -I think that's really cool. -and I think that makes it funky. -And I tell you what, I'm going to feel great selling that. And hopefully we'll find a good home for it and a great price. Time for a progress check on the stalls. Brilliant, Terry, you've done a good job. Someone has pinched a carrot. Hang on, I've found it. Oh, you see, it's a good job I'm here looking at things, isn't it? So you're pretty OK with prices, are you? -You know what you're doing? It's all stickered up? I think should really be in the pop-up auction. "give me some love." Condition is absolutely brilliant. I love this treacle glaze, absolutely love it. 'covered in a shiny brown glaze. In fact, you could keep doggy treats in there. Yeah, it's a doggy treat jar. It's got £3 on it from the bric-a-brac. I reckon I could get £9 for that. and even Chris's old mates from the fire station are here. It's been a race against time but now we're ready to throw a party. I tell you what, I was worried two hours ago. I really was genuinely worried. -Now I'm smiling, now I'm feeling confident. we've got our dancers here. -I mean, just look at this. We're about to cut the ribbons, so we'll make our way over there. Everyone is getting in place. I'm feeling good. Are you feeling good about this? -We can do this, can't we? Let's see if we can smash more than £800. wouldn't have missed this big day. -Five, four, three, two, one. This is the community coming together. people having fun in their own neighbourhood. We've got some great stuff on these stalls. I think you should buy it now. £2. Thank you very much. 'but turns out Ivor has donated his wife's favourite vase by mistake. -And now you've bought that back. -But it's all for a good cause. -Yeah, we bought it back. -And now we put a face to the whole picture. -Enjoy the day, won't you? 'Chris and Lynn are here, thank goodness. Did we go into an outside cellar? -Yes, we were in the cellar. Yes. 'I think our secret is safe. -How are you all feeling? Same here. Do you think we'll have tears from Dad at the end? Absolutely. I guarantee there will be. Do you know that? She will, won't she? ..pleased. Dad will be very emotional. He knows his grandad well. I know he does. Yes, yes. Well, I'll see you a little bit later on after the auction, OK? But I've got work to do, more money to find. That's two for £1, wow! -Oh, I would say £1. The refreshment stalls are doing a roaring trade. Purse is out, purse is out. You going to buy anything else? I think we'll have a go on some of the stalls. Now, that's smelling really good. I think we'll be giving that one away. so it's wonderful that the Nailsea Fire Brigade have turned up. -We've been taking donations to have a go on the hose. Well, so far, Chris hasn't twigged, so that's good. who knew him say what a great bloke he was. Meanwhile, bric-a-brac is flying off the stalls. But don't forget, we sent a few items off to a saleroom auction. Our auctioneer is Marc Burridge. And some of Lynn's family have come along to watch the sale. which they didn't realise they were donating to their own cause. We have this Victorian painted pine carpenter's tool chest there. What can we say to start me? 40 I have, thank you. And five. At the back. At £55, the back of the room. And there's a good result for the tilt top table. I've got high hopes for Len's walking stick. 30 in the corner. Thank you. 35, 38. Look at me, sir, not her. Thank you. Eight. And 50. Nice round figure. £50, then. And five. £60 the lady has bid in the corner. ..and the stamps and medallions. Near the door there at 50.
the Picquot Ware tea set. In front of me. 60 bid. Altogether, our lots raised £375 in the saleroom, which is amazing. so it's time for one final push. is now for sale for £1. Do you want to buy it for £1? Do you know what? I think I might be tempted. I had one of these as a little girl. -It's not mine, is it? We're finished on our stall. But are we on target to make £800? We've counted up the cash on the stalls and we've made over £500. that means we've reached the magic target already. So I've given myself a new goal. to the drop-in centre, so close to Chris and Lynn's heart. First up, Len's walking stick. Who's going to start me off with a bid of £15? I have a maiden bid of 15. I'm looking for £20 now. OK. I'm selling at £15. It's going once, twice, fair warning. Who's going to start me off with a bid of £25? Thank you, straight in, 25. Thank you at the back there. 30. You are now in. It's against you, madam, down on the front row. Now I've got your attention. 35. Yes, thank you. £40. 45. It's against you, sir. 15, no, you are nodding. £45. I have a bid of 45. And I'm selling at £45. It's going once, twice, sold, thank you. So, who's going to give me a bid of £5? Come on, animal lovers. Thank you, £5, straight in. £6. Thank you. Six, it's against you, madam. I've got six here. I'm looking for £7 now. Thank you, £7 is with me. £7, I have a bid of seven. Can I take eight anywhere? It's going once... Oh, yes, there's a bid of £8. Shout out if I can't see you. I've got a bid of £8. It's now against you. Nine, £9, it's against you. Can I take ten? Ten, thank you, £10. You are out. OK, I'm selling at £11. Yes, waving his hand up in the air. Thank you. £15, it's against you, sir. You are in. You are in. and I'm selling at 17. It's going once, twice, sold. Thank you. £5 under the tree. Six anywhere? Six? Thank you, £6 now. Still under the tree. £7. Can I take seven? I'm with you at seven. Thank you, seven down on the front row. £7 is with me now and I'm selling at seven. £8. Thank you. Eight. Do I see nine? 11. It's against you, madam. Can I take 12? 12. Can I take 15? 15 might seal the deal. Thank you. £15 is with me now. And I'm selling once, twice, sold. Thank you, £15. 'who just happens to be Chris and Lynn's son. So, who's going to start me off with a bid of £20? Thank you. Two or three hands. I'll take 20. I'll take 25. 30. Are you in for 30? 30, thank you. I've got a bid of 30, it's against you, madam. 35. The hand is still up. You are out, you are in. 40 by the tree. Thank you. You're sheltering from the rain. Thank you. 43. 44. 44. Thank you, don't lose it. 45. Any further advances on 45? You are out. Thank you so much for being the underbidder. And I'm selling at £46. It's going once, twice, sold. Thank you. So who's going to start me off with a bid of £50? 80 anywhere? I'm looking for 80. Thank you, 80. 100. 100 now. It's against you, madam. I've got £100. -30. 130, can I make that 150? Any further advances? 200, thank you. £200. That's more like it. Make no mistake, I'm selling, fair warning. Initially we set out to raise £800 here today. So thank you very much, Nailsea. You really have done it. tirelessly and selfishly for other people. They just do not stop working. They want to help other people, they don't ask for anything in return. So, you probably have guessed who it's for. ..Chris and Lynn Baker, we are here for you. Come and sit next to your husband. ..thank you. That's what this is all about. You've changed a lot of people's lives. You've helped them move on, you really have. The secret is out now and he's loving it. We've raised an awful lot of money. OK? - for an all-expenses-paid luxury trip in a hotel. Down to Cornwall to get some inspiration from the Eden Project. 'And I've got another surprise for them. Cos we know you love your football. "Chris Baker Fair Play Award." so your name will live on, OK? You'll make me cry now. We kept it a secret. nobody let out. Especially my mate who was here just now. He's gone. I didn't need to push you. I didn't push you at all. to everybody, you really are. so I think three cheers for Chris and Lynn. There you are. Enjoy the rest of the street party. This is all about you, this is your day. Just enjoy it. I think we all did a really good job. They didn't have a clue. And they think it's just worked out fab. Couldn't have been better, could it? The whole day has been absolutely wonderful. really proud, really proud of everything they've done. and this auction could be about you. and enjoyed a VIP tour of the amazing Eden Project. And it's given them lots of inspiration for their garden. Neighbours turn out to surprise a Somerset couple who have used their own experience of disability to help others. Presenters Paul Martin and Irina Aggrey collect donated items to sell at a street auction on their doorstep.